Will need a DAB ariel. 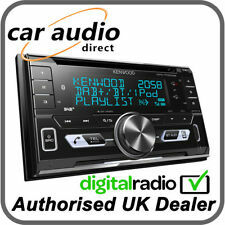 Kenwood DPX-7100DAB Double Din Bluetooth DAB USB iPhone iPod Android Car Stereo & DAB Aerial. Simply plug your smartphone device into the USB port and get all of your favourite tunes whilst on the move. Bluetooth. Includes hand-free microphone with 3m cable, for use with hands-free calling over Bluetooth. Front and rear USB ports. Built in CD player. MP3, WMA, M4A, AAC and WAV playback. 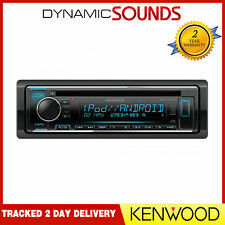 Kenwood KDC-200UB Single Din CD AUX USB iPhone iPod Car Stereo Blue Display (REFURBISHED) With 6 months warranty. The product design / style can vary due to alterations by suppliers during production. Kenwood DPX-5000BT Double Din Bluetooth car stereo with hands free microphone. KENWOOD Remote & Muisc Mix app ready. DIN Size 2 DIN. Included is microphone for hands free, wiring harness loom, din cage, trim, instruction manual, all with original box. Bluetooth handsfree & audio streaming built-in. 4.5 out of 5 stars - Kenwood DPX-5000BT Double Din Bluetooth car stereo with hands free microphone. 3 product ratings3 product ratings - Kenwood DPX-5000BT Double Din Bluetooth car stereo with hands free microphone. Kenwood KDC-BT720DAB Single Din CD AUX USB DAB Digital Bluetooth iPhone Car Stereo. FM(RDS), AM & DAB tuner built-in. DAB AerialIs Included. Bluetooth Hndsfree Calling. Easy pairing via USB for Android & iPhone. Car radio cd stereo player KENWOOD kdc-164U. KENWOOD kdc-164U. in front AUX INPUT for ipod & all the smartphones & all other mp3 players. Bluetooth adapter can also be used to stream music from smart phone. Does not require a code. Front is removable. 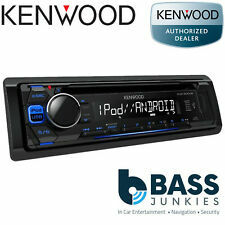 Kenwood KDC-220UI CD MP3 Stereo iPhone Andorid USB Aux Tuner Car Radio. Front AUX input & Illuminated USB with dust cover. Kenwood Sound Reconstruction. MP3 & WMA playback (CD/USB). car audio accessories. B luetooth and sat Nav can be added to it but are NOT included. Fu ll y mo to ri se d screen. ~Kenwood KDC-200UB Car Stereo ~. P lease be aware to install this radio you may need, vehicle harness, facia, and aerial adapter. If you have any doubts whether this unit will fit your vehicle speak to an audio technician before purchasing. Includes unit, box and instructions. One careful owner. Any questions please ask. FOR SALE KENWOOD DPX-503U DOUBLE DIN HEAD UNIT. All gearboxes must be filled with new oil, to the correct level upon installation. Used, Very Good Condition. Signs of usage with marks and scratches. FM(RDS), AM & DAB tuner built-in. You may require a fascia panel, aerial adaptor, wiring harness or a even a steering wheel interface kit to fit this unit into your vehicle. Bluetooth Hndsfree Calling. Kenwood double din cd player with usb and aux port, Bluetooth compatible (Not sure if Bluetooth is part of it or if an additional Bluetooth adaptor is needed) it came with a car I bought as spares or repair and I broke it for parts,it's in perfect working order,looks a brill head unit from what I found out pressing the buttons,and the screen/2 knobs flash different colours as it was on in the 10 minutes I spent seeing what it's like,and I'm impressed with it,id definitely be keeping it if my car was double din. Message me before buy it now, or call 07809 501425. Postage costs are just estimates. 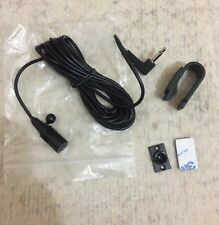 Has 3m long cable so long enough to fit anywhere in car or van. Will work with any Kenwood model. Up for sale Kenwood KDC-BT710DAB car stereo receiver with Bluetooth and USB. Kenwood, KDC-DAB4551U, Car DAB Radio / CD / USB / Aux In. Clever technology will even switch from DAB to FM (and back again) if there is a local signal problem. New Kenwood KDC-DAB4551U DAB Reciever. 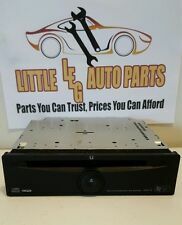 This car stereo is in in good used condition fully functioning. There are some marks and signs from use but nothing major and does not affect the functioning. Removable front panel. Removed from my motorhome,very little use. Includes instructions,wiring harness loom ISO Lead adapter. USB and AUX connections on front of unit Great sound ,in excellent condition. Kenwood KDC-BT700DAB CD Receiver with USB interface and WIRELESS BLUETOOTH. Was used in my daughters KA for 2 months and then removed after the car died mechanically so absolute minimal wear and tear and appears like new :-) By questions welcome, and we're including the mounting plate, fascia plate, warranty card, stereo keys - this unit is ready to fit immediately :-) Condition is Used but might as well be nearly new! Dispatched with Royal Mail 2nd Class. Has a detachable Face - not tested but was working fine when taken out of the car. JMV AUTO SALVAGE PARTS AND SPARES. Shows slight sign of use. Spotify App Link. FM(RDS), AM & DAB tuner built-in. Bluetooth Hndsfree Calling. Easy pairing via USB for Android & iPhone. MP3, WMA, AAC, WAV & FLAC playback. Steering Wheel Interface Ready (Not Included). V ery rare carbon look model and not many were sold of these. SPECIFICATION: CD/MP3 Tuner with Aux input on front panel for Portable MP3/iPod. CONNECT YOUR IPOD OR PORTABLE MP3 PLAYER DIRECTLY INTO THE SOCKET ON THE FRONT PANEL OF THE STEREO (USING A STANDARD AUX CABLE). Vauxhall Corsa D 2006 - 2014 Kenwood Double Din CD MP3 USB AUX iPhone iPod Car Stereo & Piano Black Fascia & Fitting Kit. Kenwood’s new DPX-3000U double din stereo. Made for iPod & iPhone. Vauxhall - Corsa D - 2004-2014. This is an unused, new & boxed Kenwood KDC-3024G CD Receiver. RDS FM/AM/MW Radio. Force Majeure. 20-12-2018 14:41:35. High spec model with motorised front panel. Very Good used condition as shown. (MANUFACTURER REFURB WITH 6 MONTHS WARRANTY). iPod/iPhone devices are catered for on the KDC-220UI via its front mounted full speed USB input. Charging of USB connected devices is helped by the high 1amp maximum output. Vauxhall Astra H 2004 -2010 Dark Grey Fascia Kit & Kenwood Double Din CD MP3 USB AUX iPod iPhone Stereo. Vauxhall - Astra H - 2004-2010. Kenwood’s new DPX-3000U double din stereo. Made for iPod & iPhone. KENWOOD KDC-X5200BT. Kenwood Music Mix - 5 phones can connect for music streaming. Kenwood Remote App for easy set up - IOS & Android. MP3 CAR VAN STEREO WITH CD USB & BLUETOOTH. Android music playback via Bluetooth or connection. Front AUX input & Illuminated USB with dust cover. Kenwood CD MP3 USB Car Stereo. Kenwood Sound Reconstruction. Tuner Features. MP3 & WMA playback (CD/USB). iPhone & Android Music Playback. WAV & flac(48kHz/16bit)files playback (USB). 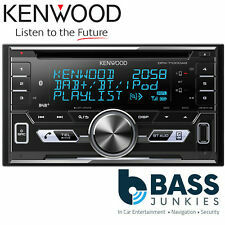 Kenwoods new DDX5016DAB Double Din 6.2" Tuner with CD/DVD, USB Made for iPod & iPhone, built in bluetooth & DAB . DAB ANTENNA IS INCLUDED. INCLU DES STEREO,FITTING CAGE, ISO LOOM, DAB ANTENNA, INSTRUCTIONS. Kenwood KDC-MP5028 CD Player Rear RCA Aux Inputs HD/ 4.0v Preouts Tested!